What it is: [Target product description] The B. Zany Zoo Wooden Activity Cube changes the playing field for wooden blocks. 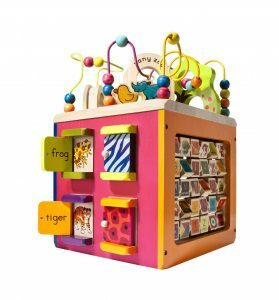 Not just a solid cube with carved sides, this activity cube is filled with fun activities, brilliantly colored animals and a roller coaster on top. Tons of toddler toys are packed into this 1 cube and hours of fun are packed in there, too. Encourage busy little minds to explore the world around them with B. Zany Zoo. Animals. Colors. Shapes. Letters. Fun. 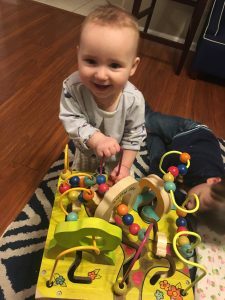 What I love: I have had this little activity cube since my first was about 7 months old, and he still loves it at 3½ – and now that we have another little baby around here, this thing gets very frequent play! For the littlest ones, the side with doors is a super fun cause-and-effect activity: I open the doors, and you close them. As they get older, it is fun for them to manipulate the doors and pracitce opening and closing them. The side with the “race” between the three animals is my toddler’s current favorite – and takes a good amount of dexterity to play with. It’s fun to ask him which animal he thinks will win the race. The top of the cube is also great at building motor skills, and my toddler uses his visualization skills to figure out how to reach the animals he wants to play with most. There is also a side that has each letter of the alphabet, paired with a different animal – and I love that the animals B. chose are a little bit wacky (the N is a narwhal – I die). As my son gets a little bit older, we will work on code-to-sound and sound-to-code identification of the letters. 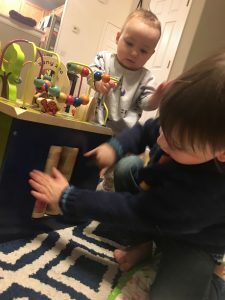 The best part of all is that this activity cube is very sturdy, made of wood, and requires NO BATTERIES – I love a toy that my kids love to play with that doesn’t light up or make noise. I also love that they can play with it together. Sibling play is the cutest! What I would change: The top has so much going on that it can be a little bit overwhelming to decide what to play with. Otherwise, I think this is a pretty perfect toy for older infants through toddlers!